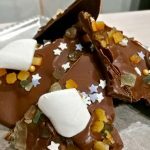 This Festive Chocolate Bark is a simple, yet decorative and very much delicious dessert. Perfect as an edible gift or late night snack on a cold winter night, or a fancy dessert on your Christmas feast! Melt the chocolate. I used the microwave, 30 seconds at a time, mixed it, then back again, until it's completely melted. Pour the chocolate on a non-stick tray or silicone mat and spread it out evenly. Sprinkle it with the gingerbread spice and the sprinklers. Push the marshmallows and the candied peels into the chocolate before it solidifies. Put it in the fridge for 15-20 minutes.